When Zoomer starts to play, it’s almost impossible not love him! 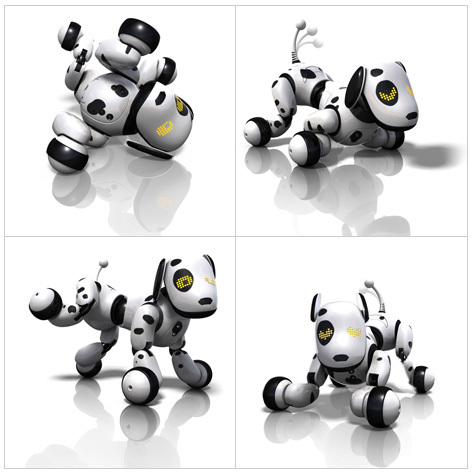 This incredible little robotic dog is the first toy to have such a wide array of movements and expressions that help to make him seem almost real. Like all virtual pets, he learns as he goes along. He gets really excited when his owners teach him new tricks, and he just loves his tummy being scratched! A free Android or iOS app helps Zoomer’s owners learn all about training and using their new found friend. His electronic eyes follow you around and also indicate whether he’s happy, sad, excited or even tired out. The clever animatronic movements of his head, body and legs enable him to even lie down asleep on his side, and with a yawn he’s up on his feet again ready to play some more. His wagging tail is a constant source of delight and amusement to his owners. Just like a real dog, these movements indicate his feelings of happiness or contentment. Distributed in the UK by Spin Master, Zoomer can be purchased from all great independent toy shops as well as a selection of online retailers. Some children may prefer the teacup sized Zoomer Zuppies. Using the same technolgy as their bigger brother but in a smaller size, each one has its own name and distinct personality. The life-like LED eyes can make a wide range of expressions, and with many different ways to play, Zoomer Zuppies can be taken anywhere in a handbag or rucksack. Please tell us what you think of Zoomer Dalmatian by Spin Master.